Gold has extended its price gains for March, hitting $1,322.48(XAU/USD) at the end of Monday, it’s highest price since February 28th. This growth reflects safe haven demand as investors hedge against worsening global market conditions as a result of creeping concerns over an economic recession in the US, the continued contraction of the German manufacturing sector and the ongoing Brexit saga. Gold started 2019 strongly, rising above $1,340 on the 19th of February, before prices temporarily crashed down to $1,292 on the 1st of March. The yellow metal has since gone on to shine again, last week posting its third consecutive weekly gain. No real surprise for some though: these returns are simply in line with numerous bullish forecasts for 2019. Asset management firm Altana Wealth wrote in a note to clients; “We are entering a period of high uncertainty for fundamentals and risk assets and if this were to heighten further, gold could break out substantially, helped by safe-haven flows, lower yields and expectations of a possible return to quantitative easing,” (Reuters). INTL FCStone analyst wrote; “The dollar has been a bit weaker along with equities. A lot of macro numbers we have been getting have been deteriorating sharply. Central banks, which are already dovish, will be more dovish, which is good for gold,” (Reuters). Meanwhile Business Insider revealed that central banks have bought more gold than at any time since the end of World War II, as the commodity becomes an increasingly valuable hedge against growing global instability. 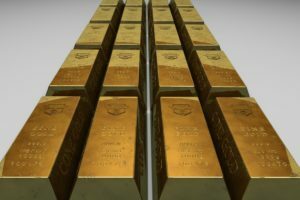 2019 set be a record breaker for Australian gold production? Australia’s gold production hit a record high of 317 tonnes in 2018, according to gold consultancy firm Surbiton Associates who valued the production at A$17.3 billion at the average spot price. The previous record of 314.5t was set back in 1997. But with 2019 set to be another big year for Australian production, we may not be waiting long for a new record number. 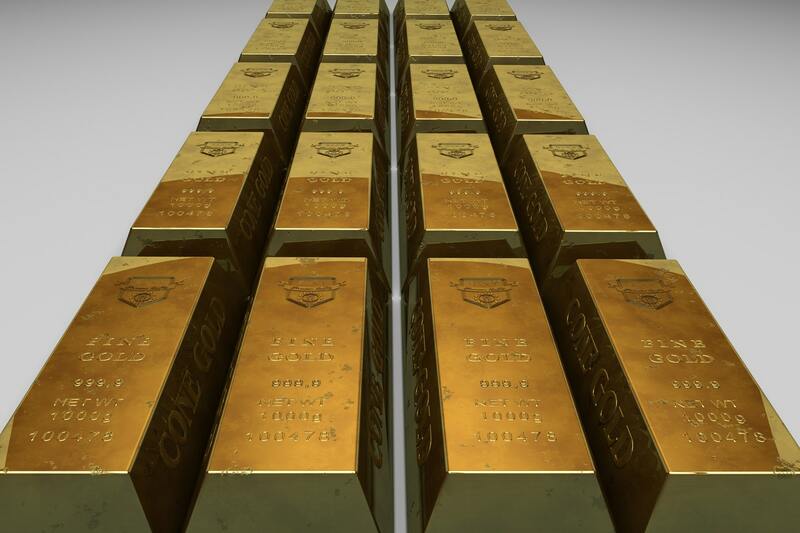 While global gold production in 2019 is expected to be stable, outputs in Australia-Oceania, Europe and Africa are expected to rise. Australian gold miners have also benefited from the twin effect of rising gold prices and falling value of the Australian dollar. Evolution Mining, Northern Star Resources and Newcrest Mining have also seen their share prices pushed higher (Forbes). Australia’s biggest gold producer, Newcrest Mining, revealed last month that it had raised its ‘underlying profit in the six months to December 31st by 104% to $168 million ($A237 million) thanks to a 6% increase in gold production and a 13% reduction in costs’ (Forbes). Another company making moves in Australia is AIM listed precious metals exploration and development company ECR Minerals (AIM:ECR). Focusing their attention on the Central Victorian Goldfields and the Yilgarn Craton in Western Australia, ECR have amassed a growing portfolio, which has not gone unnoticed by the mining industry and investing community, particularly following the appointment this month of Australian mining industry veteran Sam Garrett to the board. Following oversubscribed fundraising initiatives in 2018, coupled with expected R&D rebates from the Australian government, cash balances are strong and see ECR fully funded through to Q2 2020. 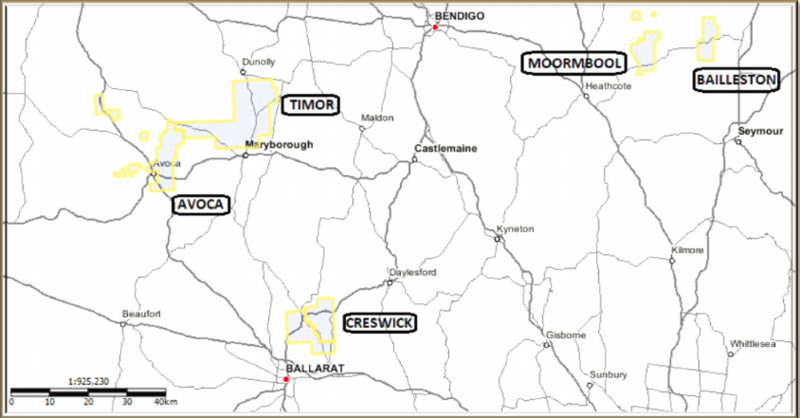 ECR currently holds five highly prospective projects located geologically within the major orogenic Lachlan Fold Belt in the historically prolific Central Victoria region. These are Avoca (EL5387) and Bailieston (EL5433) held since 2016; Timor (EL006278) and Moormbool (EL006280) since 2017; and Creswick (EL006184) since early 2018. ECR also applied for three additional tenements around Bailieston and one near Creswick at the end of 2018. ECR’s Victoria projects are sited close to mines and projects owned by some of the largest gold producers in the world. Fosterville, Australia’s fifth largest gold producer is located just 50km to the west of the Bailieston project, while Newmont Mining has applied for a mining license on ground adjacent to ECR’s Bailieston project. 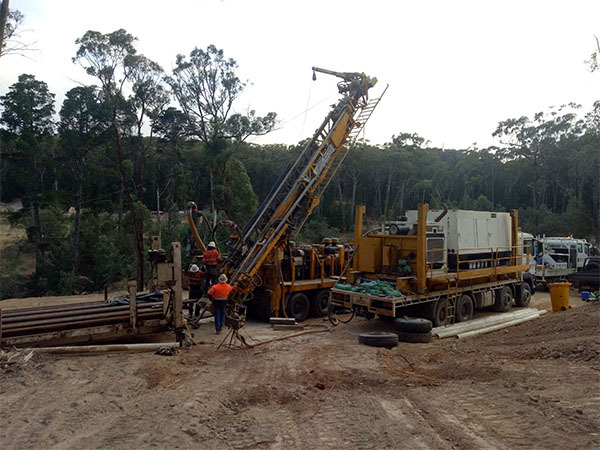 In Q1 2019, ECR currently has two ongoing drilling campaigns across three prospects in the Victoria region. 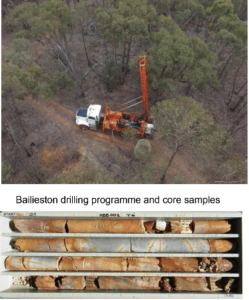 The company announced on the 28th of February that a combined 2,461 metres of reverse circulation drilling had been completed in less than a month at the Creswick and Bailieston Blue Moon prospect. Subsequently high grade gold assay results were reported from the Blue Moon prospect at the Bailieston gold project. Significant intersections reported include 2 metres @ 17.87 g/t gold from 57 metres down hole in BBM007 within a zone of 15 metres at 3.81 g/t gold from 51 metres. ECR also announced on the 4th March that an additional 250 meters of rotary air blast drilling had been completed at the Company’s Black Cat prospect in the Bailieston project area. The 10 target holes were drilled immediately south of territory included in the Newmont Mining license application. Despite the high profile nature of their Victoria projects, ECR have remained both ambitious and strategic in their exploration plans. The company announced at the beginning of January that it had applied for 9 new exploration licences covering approximately 1600 km2 in the Yilgarn region, Western Australia. At the time, Craig Brown said he expected the license applications to be approved within the next three to six months. The Yilgarn Craton geology is extensively documented. The region is known to host around 30% of the world’s known gold reserves and produces two-thirds of all gold mined in Australia. Unsurprisingly the area attracts more than half of Australia’s minerals exploration expenditure. As such, ECR have been very lucky to pick up such prospective potential undercover greenstone acreage, in one of the world’s most productive gold provinces. As already stated, ECR announced the appointment of Sam Garrett as the new Non-Executive Director at the end of February, a move that brings substantial credibility to ECR and significantly strengthens the team led by Craig Brown. With 30 years of exploration management, project assessment and operational experience working for large multi-national and junior mining and exploration companies in ten countries, Mr Garrett is an excellent addition. Craig Brown commented:“Sam brings extensive geological experience onto the board, not just in Australia but also in South America and the Philippines, where the Company has existing business interests. With the yellow metal firmly back in the spotlight and likely to stay put, going digging for gold looks like a no-brainer option for investors, with Australia probably offering the richest cross section of opportunities at this time. With a highly educated workforce, the latest technology, fantastic infrastructure and a pro mining government, Australia is the premier destination for doing business when it comes to gold. If you’re looking for a gold small cap with experienced management, strong finances and sites that have the potential to deliver big then ECR looks a great buy. Their exciting Victoria projects have already began to demonstrate their huge potential, whilst additional sites in an in demand Western Australia offer a massive opportunity and great potential upside for the company. ‘The company is well resourced and planned exploration only makes a relatively small dent in funds. This implies little to no dilution in the short term. Therefore we have rated ECR Minerals as a Long position with a 12-month target price of GBP 2.5 pence’ (Hallgarten & Company). At the beginning of last month the precious metals exploration and development company, ECR Minerals (AIM:ECR), revealed it had applied for 9 new exploration licences in the Yilgarn region of Western Australia. 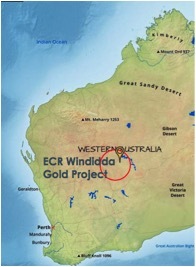 Named the Windidda gold project, the applications represent another major push forward by ECR following their successful strategic financings in July and December last year. ECR is now fully funded to develop its burgeoning asset portfolio through to June 2020. The Windidda land package will complement the company’s already extensive gold portfolio in Victoria, as they press forward with their mission to deliver shareholders the next multi-million ounce gold resource. The Windidda applications, which lie east of the town of Wiluna, cover a total of 523 graticular blocks representing roughly 1,600km2of the Yilgarn Craton. 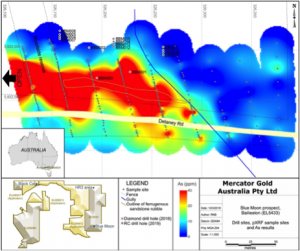 The area is highlighted as holding the potential to contain significant Archean greenstones, which are known for hosting many of Australia’s and the world’s richest gold deposits. “Greenstone-hosted gold trends in the Western Australian Yilgarn province are very tightly held and access to free ground, when it becomes available, is highly competitive. Previous exploration in the area has focused on base metal and manganese deposits only. However, pre-existing data from these projects will enhance ECR’s opportunities here. “There was some work completed in the 1980s and 1990s but they were looking for nickel at the time, and they also found molybdenum. So one of the first things we’re going to do is go over that old information. Because nobody’s ever looked for gold here” says Brown. This was in part due to the potentially mineralised rocks lying under cover, however ECR believes this cover to be shallow and are hopeful the drilling will be relatively straightforward. ECR plan to use aircore drilling across gravity-magnetic anomaly targets to allow for rapid assessment of the potential for gold mineralisation. 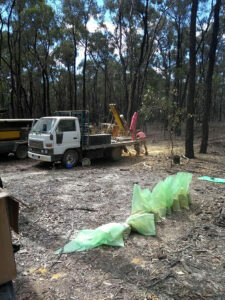 This under-cover greenstone gold exploration model has been successfully tested by Greatland Gold (LON:GGP) at its Ernest Giles project located approximately 125 kilometres east of ECR’s Windidda project. Evidenced as containing the oldest crust on earth and abundant Archean greenstones, Australia’s Yilgarn Craton is one of the world’s most important gold provinces. The region has had a history of significant gold production for over a century. Since the 1980s the Yilgarn Craton has re-emerged as one of the world’s premier gold-producing areas and the site of some exceptional exploration successes. For three decades since 1979, the Archean Yilgarn Craton has sustained a tenfold increase in production and along with Nevada its growth has outperformed all other parts of the world. Across this period over 8000t gold (270 Moz) in the Yilgarn Craton have been discovered. To put this success into perspective, no region has ever had an equivalent period of gold discovery except for South Africa immediately after 1886 and again around 1930–1940s (Phillips et al, 2019). The Yilgarn Craton is host to around 30% of the world’s known gold reserves and produces two-thirds of all gold mined in Australia. Unsurprisingly the area attracts more than half of Australia’s minerals exploration expenditure. Many of the richest gold deposits in the world, including Kalgoorlie’s Golden Mile, are hosted in the Yilgarn’s greenstone belts. These exposed packages of ancient volcanic and sedimentary rocks have been metamorphosed over millions of years. 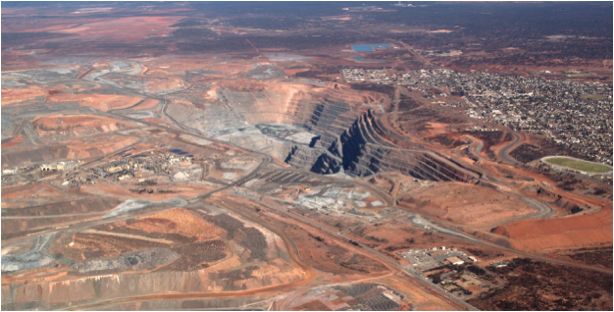 At almost 4km long, 1.5km wide and 500 metres deep, the world-famous Kalgoorlie Super Pit alone produces up to 800,000 ounces of gold per year. The Super Pit is owned by Kalgoorlie Consolidated Gold Mines Pty Ltd, a company owned 50:50 by the two of the world’s largest gold mining companies Barrick Gold and Newmont Mining. Greatland Gold’s Ernest Giles project, which at 2,000sq km extends over a slightly bigger area than ECR’s Windidda, is believed to hold the potential to deliver the discovery of large +5 million ounce gold camps and 5-10Mt nickel deposits. Meanwhile, Blackham Resources Ltd’s Wiluna mine has produced over 4 million ounces of gold from 20 open pits and 3 underground mines. In addition to gold, the Yilgarn hosts approximately 20% of the world’s nickel reserves, 80% of the world’s tantalum reserves, and considerable iron ore, copper, zinc and minor lead reserves. Located in the world-class mining region of Western Australia, known for holding Archean greenstones, ECR’s latest Windidda project looks an exciting addition to an already promising portfolio in Australia. The region’s rich history of producing significant gold deposits and continued expansion over the last 3 decades provides firm evidence of the ongoing potential for new entrants. The new site will compliment ECR’s Bailieston, Moormbool, Creswick, Timor and Avoca projects. ECR’s Bailieston and Moormbool projects received instant validation of their prospectivity in November after Newmont Gold applied for a license adjacent to Bailieston. 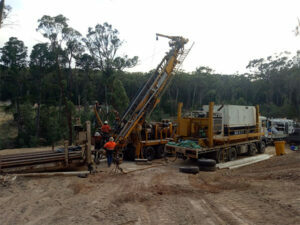 ECR also announced last week that an initial four holes had been successfully drilled at its Creswick gold project, with additional drilling also underway at the Black Cat prospect within the Bailieston gold project area. This veritable hive of activity is further underpinned by the rising gold price. The yellow metal hit a 7 month high as it broke through the $1,300 mark last Friday, which helps put ECR’s paltry market cap of just £3.7m firmly in bargain territory. E CR Minerals plc (LON:ECR) the precious metals exploration and development company is pleased to announce that following the announcement of 17 December 2018 and following regulatory approval, the directors of the Company (David Tang and Craig Brown) have subscribed a combined total of £20,000 on the same terms as the financing set out in the earlier announcement resulting in the issue of 2,857,143 new ordinary shares. In total, including the funds raised in the first part of the financing announced on 17 December 2018, ECR has raised £700,000 through the through the issue of 100,000,000 new ordinary shares at 0.70p per share (“Financing Shares”). Each Financing Share has a warrant attaching to subscribe for a further new ordinary share in ECR Minerals plc at a price of 1.125p within two years of the admission date of the above financing shares resulting in the issue of 100,000,000 1.125p warrants. Admission is expected to occur on or around 21 December 2018. Following Admission of the Financing Shares, ECR’s issued ordinary share capital will comprise 445,840,783 ordinary shares of 0.001 pence. This number will represent the total voting rights in the Company, and, following admission of both the placing and subscription shares, may be used by shareholders as the denominator for the calculation by which they can determine if they are required to notify their interest in, or a change to their interest in, the Company under the Financial Conduct Authority’s Disclosure and Transparency Rules. The new shares will rank pari passu in all respects with the ordinary shares of the Company currently traded on AIM. On Admission, Craig Brown will hold 2,977,842 ordinary shares representing 0.67% of the Company’s issued share capital. Likewise, David Tang will hold 1,428,572 ordinary shares representing 0.32% of the Company’s issued shares capital. 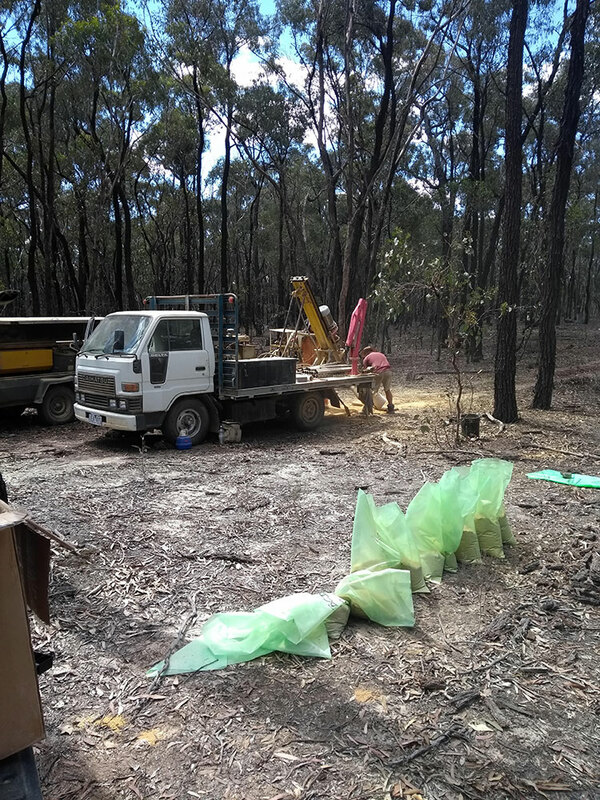 ECR Minerals plc (LON:ECR) the precious metals exploration and development company is pleased to announce the Company has submitted new licence applications to augment its existing gold exploration interests in the Victoria region of Australia. Further work is being undertaken to add additional licence application ground in Australia where the Company has identified strategic exploration opportunities. Craig Brown, Chief Executive Officer of ECR Minerals plc commented: “I am delighted to announce today that the Company has successfully submitted four new applications which materially bolster our strategic ground holding and provide significant additional exploration opportunities for our Australian operations. The recent application submitted by Newmont Exploration Pty Limited over a large area bordering our Bailieston and Moormbool gold projects is an important ratification of our strategic Australian gold positioning. The presence of Newmont adds weight to the potential prospectivity of the area. ECR’s exploration work at Bailieston has recently demonstrated gold prospectivity as highlighted by the results of our Bailieston sampling programme announced on 28 September 2018 with gold grades up to 67.4g/t. At Creswick and as announced on 25 September 2018 our exploration mapping revealed a large gold system, and reflecting our wider exploration work to date, we have taken the opportunity to secure more strategic ground south of our existing Creswick project area.